Andrew Stephenson, the Conservative MP for Pendle, Lancashire, has welcomed news from Pendle Borough Council that the Parish members have voted in favour of setting aside funds for the treatment of Japanese knotweed (Fallopia japonica). The Japanese knotweed is growing along the banks of the Kelbrook Beck, which goes through Kelbrook village. 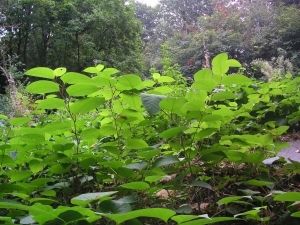 The Council’s environmental action group have been authorised to treat the Japanese knotweed, with the works due to commence in spring 2014. “This was a problem that had been building for some years. I am delighted that action will now be taken. I would like to thank those at Kelbrook Parish Council who I know have been pushing for a way forwards for some time”. Japanese knotweed is native to Japan and Korea. It was introduced to Britain by the Victorians in the 1800s and it initially won prizes as an ornamental plant. However, it soon started to cause problems and spread. Since the Second World War its spread increased significantly and it can now be found in most parts of the country. Since 1981 Japanese knotweed, and also Giant Hogweed, were the only two terrestrial plants listed in Schedule 9 Part 2 of the Wildlife and Countryside Act 1981. In Section 14 of this Act it states that it is illegal to allow plants (listed in Part 2) to grow in the wild. This has been shown in case law for it to be an offence to allow a plant listed in Schedule 9 Part 2 to grow across a site boundary onto someone else’s land. In 2010 the list of plants included on Schedule 9 Part 2, was increased to include a number of new plants including Japanese knotweed hybrids. Cross boundary growth of Japanese knotweed is a particularly serious issue for large landowners, such as Local Authorities, Network Rail, the Canal and River Trust, Environment Agency, Scottish Environmental Protection Agency, and Natural Resources Wales. The establishment of the Property Care Association Invasive Weed Control Group (PCA IWC), as an independent trade body that assists its members, sets minimum standards, and provides insurance backed guarantees is a huge help to landowners and private individuals.